Tom runs his eyes over the fantasy relevant midfielders from this year’s draft crop. As we turn our eye to Fantasy 2019, Tom has been looking at all of the draftees throughout the season and shares his watch-list for the upcoming season. Today he profiles some midfielders to keep an eye on over the pre-season. Click here for the defenders. Click here for the forwards. Click here for rucks and utilities. 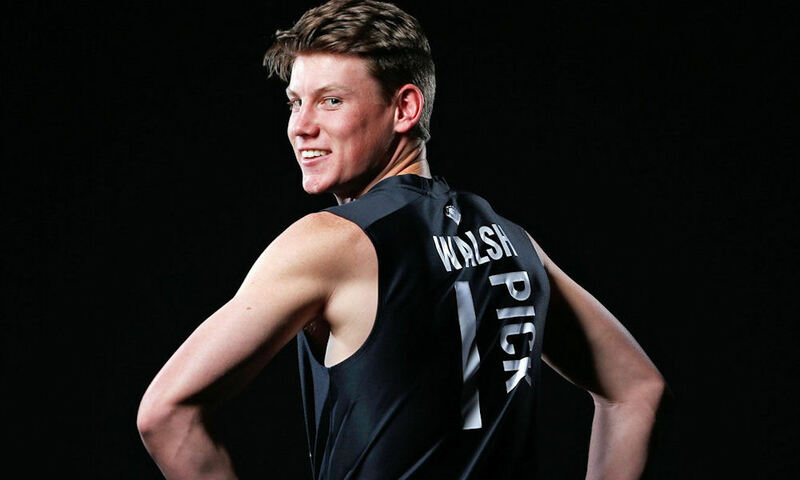 The head prefect and figurehead of the 2018 AFL Draft, Sam Walsh is commonly touted as the most complete midfielder in the draft pool. A highly productive and consistent ball winner for both the Geelong Falcons and Victoria Country, Walsh has an ability to win the ball on the inside and outside and generally uses it well by foot. Although not overly quick, Walsh moves with genuine class, can run all day and has been likened to GWS’ Josh Kelly as a result. Walsh averaged 29 disposals, 3.7 marks, 5.5 tackles and 111 fantasy points in 16 recorded matches this season, proving what a balanced, all-round game he is equipped with. A certainty to play from just about round one next year, likely on the wings whilst he is still skinny, Walsh will be given ample opportunity at the Blues alongside midfield brute Cripps. On-ball accumulator Jackson Hately has already experienced senior football this season at SANFL level with Central Districts and will be expected to help fill the gaps left by departed on-ballers Tom Scully, Dylan Shiel and Will Setterfield. Hately, a South Australian midfielder with a modern-day tall frame, is a terrific extractor at stoppages, clean at ground level and can also find it on the outside thanks to a strong aerobic capacity. At Centrals, Hately was also utilised as a half-forward to strong affect, managing to impact the scoreboard frequently. Averaged 20 disposals, 4.2 marks, 5.5 tackles and 90 points in 16 recorded games as another midfielder with an evenly balanced game. Given his ready-to-go mould and previous senior exposure, Hately is ready to slot straight into the Giants side. In what proved to be one of the most exciting moments on the first night of the National Draft, Carlton traded up to Adelaide’s pick 19 to select bull-like midfielder Liam Stocker, who the club rated in their top ten. Winner of the TAC Cup’s Morrish Medal as the best player in the country’s premier under-18 competition, Stocker is a strongly-built, powerful contested ball winner. A stoppage specialist, Stocker has a burst of power and explosiveness when exiting traffic in tight. During the course of the year, his disposal numbers (averaged 12.9 kicks and 9 handballs) stacked up well, as did his average fantasy score of 87 points. The Blues will no-doubt provide opportunities, but questions marks remain over his running capacity and perhaps lack-of versatility. Bailey Smith is the ultimate professional and will add a mix of contested ball winning, speed on the outside and in congestion and neat foot skills to the Bulldogs list. Victoria Metro’s best performed player during their runner-up Championships campaign, Smith averaged 28 disposals, 3.1 marks, 6.2 tackles, 0.9 goals and 111 goals per game in six 2018 matches, having struggled with injury at times. Luke Beveridge has a handy decision to make in regards to where Smith may spend more time next year. Whilst he looks best as an inside midfielder, his endurance and strength will need a bit more development, which could see him utilised on a wing, across half-back (where he played for Sandringham and Victoria Metro in 2017) or the half-forward line. Expect the future captain to compliment Macrae and Bontempelli nicely and play games from the get-go. With the final selection of the National draft, the Bulldogs reached into the VFL to pick up Footscray midfielder Will Hayes. A standout for the side at VFL level, Hayes won the best and fairest in a season where he averaged 26 disposals, 4.2 marks, 4.5 tackles and 100 points. Capable of playing as an inside midfielder, Hayes may find a role either on a wing or across half-forward in the AFL, where his foot skills, run and carry can damage the opposition. A solid all-round athlete, Hayes is another mature-aged prospect brought in to make an impact from day one. Williamstown’s Brett Bewley was one of a few VFL stars desperately hoping to make the pivotal jump into the top tier of football. An on-baller who is capable on the inside and outside, Bewley is one of the most well-rounded prospects, having averaged an impressive 25 disposals, 4.3 marks, 4.1 tackles and 99 Fantasy points for the Seagulls in 2018. Fremantle perhaps see him as a candidate to fill the void left by Lachie Neale. Bewely capped of yet another consistent year by starring at the Victorian state combine, posting excellent results in the 20m sprint (2.99 seconds), agility test (8.31 seconds) and yo-yo test (level 22.2). A ready-to-go midfielder, expect him to make one of the biggest impacts of any draftee next season. Yet another Jack joins the St.Kilda ranks and Bytel may prove to be the steal of the draft, with back injuries ruining much of his draft year. Rated highly at the beginning of the season, due to an excellent bottom-aged year, Jack is your classic big-bodied midfielder. He is a terrific contested ball winner, a fierce tackler and productive accumulator. He averaged 17.5 disposals, 5.4 tackles and 70 Fantasy points in nine 2018 matches. If St. Kilda manage his back complaints effectively, there is little reason why he can’t make an impact next season, given his size and the Saints requirement to blood their youth. South Australia’s Championship winning captain was invited to round one of the draft, such was the anticipation of him being an early selection. However clubs, including SA-based Adelaide continued to bypass the midfielder because of his lack of athleticism and it took until Fremantle’s selection at 32 for Luke Valente to find a home. Although he spent much of the year injured, Valente was a consistent player for SA at the Championships, winning their MVP award and averaging 22 disposals, 2 marks, 5.5 tackles and 87 Fantasy points. With the Fremantle midfield requiring another bigger body alongside star Nat Fyfe, Dockers fans will quickly warm to their potential future captain, who possesses elite foot skills, contested ball winning and production. Regarded as a terrific character, Valente will be expected to play games next year given his ready-made size, although his endurance is largely unknown given he didn’t test at the national combine. The 19-year-old Western Australian missed out on being drafted last year, but returned to play and star at the mid-year National Championships. Foley is a tall, consistent midfielder who can win the contested ball in tight, tackle hard, hit the scoreboard and use the sherrin cleanly by hand and foot. A productive disposal-getter for WA, averaging 17 disposals, 3.3 marks, 7 tackles, 0.7 goals and 89 fantasy points. Although an extremely strong side, West Coast are not afraid to play their draftees and given Foley’s midfield flexibility and size, he has the potential to be a midfield option for our fantasy sides as soon as next year. Rhylee West, the son of Bulldogs legend Scott, joins the kennel as a talented midfielder looking to forge his own career, potentially filling Luke Dahlhaus’ role. West is a small midfielder but has a set of likeable traits to distinguish himself from the rest of the field. He is a productive ball winner, is quick, hits the scoreboard often and loves a tackle, just like his father. Rhylee averaged 20 disposals and 83 points in 10 games for Victoria Metro and Calder Cannons. Although physically ready to play, West will need to improve his aerobic capacity, which could restrict him to a small forward or outside midfield role. He should be on the watch-list. Ely Smith was perhaps one of the surprise selections of the first round, however his season form suggests he could be one of the most fantasy relevant of the draftees. Yet another big-bodied midfielder, Smith was not initially selected for Victoria Country’s Under-18 Championships side, but was rushed into the team for their last match on the back of irresistible TAC Cup form for the Murray Bushrangers. He came in and dominated that game and proceeded to perform well for the remainder of the season, finishing with an average of 26 disposals, 2.4 marks, 5 tackles and 91 points. A stoppage specialist, Smith, unlike many other tall inside midfielders, also possess a number of strong athletic traits, particularly his leap, speed and agility. Yet another country Victorian joins the Lions den, and Smith could make an impact in the midfield early. With Tom Scully out the door, a spot on the Giants wing appears open, and Vic Metro skipper Xavier O’Halloran could slot straight in. O’Halloran is a balanced midfielder who is extremely athletic, provides run and carry and makes an impact with each of his disposals. Although it is hard to see him breaking into a role on-ball for the likely finalists, the former Western Jet could instead utilise his endurance, speed and agility on a wing or across half-back. Although his kicking can be inconsistent and he wasn’t a huge ball-winner throughout 2018 when compared to other mids (averaged 16 disposals, 4.3 tackles and 74 points), you get the feeling Xavier will debut at some stage next season, especially if the clubs injury woes roll on another year. Caldwell has spent more time injured than on the footy field over the past year. However when he is in full flight, Caldwell has the potential to be one of the most dominant midfielders from the ’18 draft pool. His blend of acceleration from the contest, contested ball winning and smarts around goals could see him fill the void left by Dylan Shiel and potentially Will Setterfield. He is only of average height, yet reasonably developed physically – a standard prerequisite for those aspiring for an early debut. In the four games he managed in 2018, Caldwell was a low possession getter, averaging 11 disposals, 3.9 tackles and just 49 points. However he was injured early on in the game for Vic Country, thus reducing his season statistics. Could also play as a small forward given his goal sense. Tom runs his eyes over the fantasy relevant forwards from this year's draft crop. Tom runs his eyes over the best defenders from this year's draft crop.